When it comes to dessert, just pass me the potatoes. It’s not that I don’t appreciate a good sweet… I definitely partake. But... unlike most savory foods... that quintessential, end-of-meal treat really has to grab my attention to sway my taste buds to the sweeter side of things. Sometimes, it’s simply the name and/or description. So… it comes down to the ever-important word… or words, in this case. Without benefit of a visual, the menu really has to make me a believer. Berries & Bubbles. That was the name of the dessert on the menu at Higgens on a recent dinner out that piqued my attention. Not fruit and sorbet, that just wouldn’t be enough… housemade or not. It’s the kind of name that puts a smile on your face… maybe even a name that might elicit thoughts of ilicit thoughts… even if those thoughts are simply ones that cause you to teeter-totter between indulgence and restraint. On most occasions while dining out we respectfully accept receipt of the dessert menu, peruse it carefully, contemplate a few offerings, get ahold of our senses… and politely decline. However, as I’ve said on many an occasion, my idea of a great dessert is simply a bowl of beautiful summer berries topped with a dollop of sweetened cream or yogurt. On this occasion, with temps in the 90’s, a refreshing sorbet in lieu of yogurt was hard to resist. And then our server referred to this particular dessert as Summer in a Bowl. 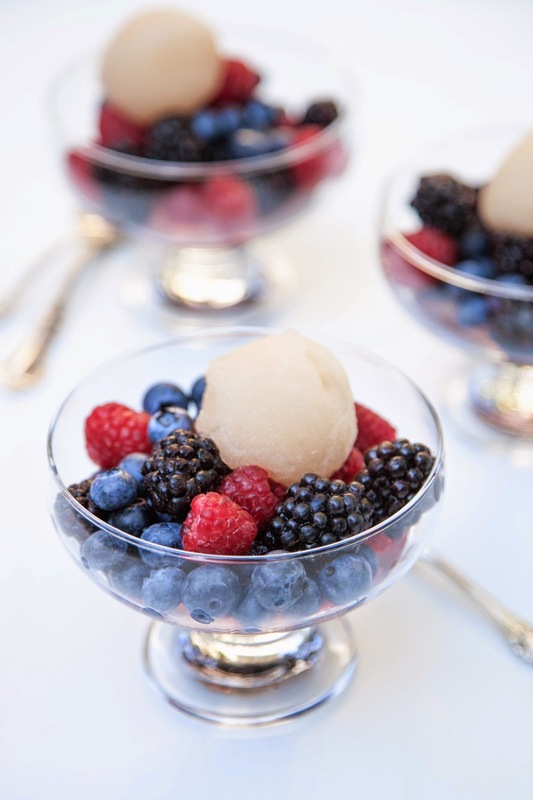 Berries and Bubbles, Summer in a Bowl… how can you go wrong? Though not typically a sorbet-type-of-girl, our server was all over the fresh, light, effervescent quality of this champagne-based sorbet. My issue with most sorbets is they are often too sweet, or far too tart… or both. However, I was really pleasantly surprised by the deft and balanced hand with this sorbet… refreshing, subtly sweet, light, and bright; a perfect partner to a bowl of plump, fresh, brilliant-hued berries. Many of the recipes I could find utilized some sort of citrus… grapefruit and lemon were the predominant go-to suggestions. And… many advised to cook off the champagne a bit to reduce the alcohol content… bettering your chances for a decent freeze. I adhered to both these tenets of thought, pairing fresh grapefruit and lime juices and cooking down the champagne and sugar with a little sparkling water and lime zest to get a great champagne-simple syrup. The end result truly tastes like Summer in a Bowl. Coupled with a sweet breeze, this Berries & Bubbles treat is delightfully refreshing… far more so than another scoop of potatoes. Combine sugar, champagne, sparkling water, and zest in a saucepan set over high heat. Stirring regularly, bring the mixture to a low boil until the sugar is completely dissolved. Reduce to a strong simmer and continue cooking for another minute. Transfer mixture to a bowl to cool for 20 to 30 minutes (steel bowl is preferable, as it will cool even quicker). In the bowl of an electric ice cream maker, churn champagne mixture (according to manufacturers directions), until a light sorbet forms. Using a Cuisinart ICE-21, it took 8 to 10 minutes to achieve. 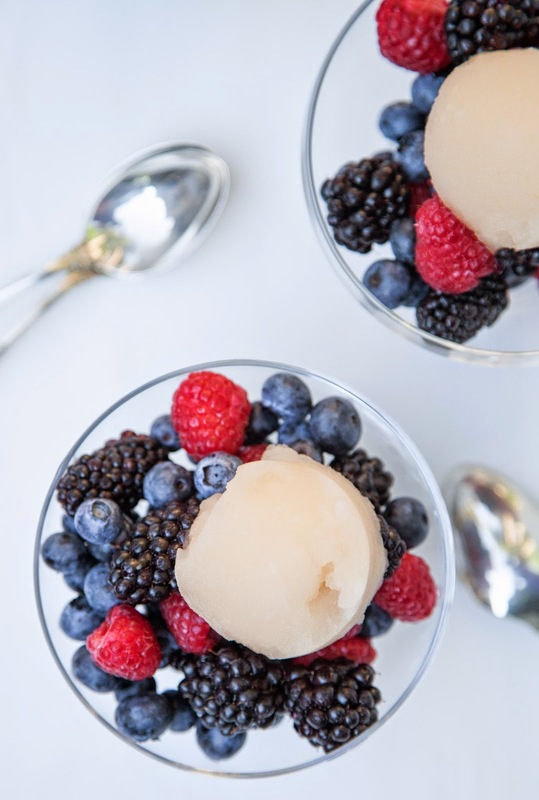 Transfer sorbet to a freezer-friendly dish, cover and store. 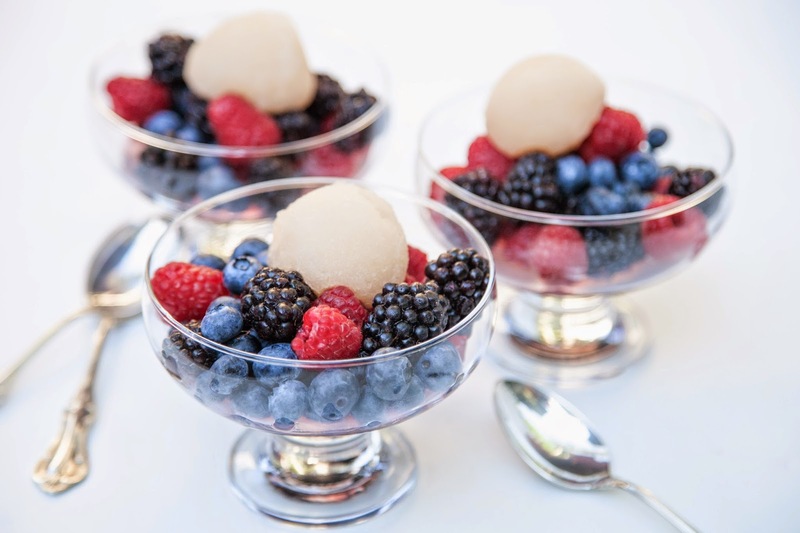 To serve, scoop and top berries. * If you have room in your freezer, away from other foods, you can chill mixture for 2 to 4 hours rather than waiting overnight.